KidzView Get a gondola ride and go cross country skiing too! For Sanity's Sake: Enjoy the excitement of Northstar's resort. The Nordic Center is at the heart of Northstar's Snosport activity. Cross-country, telemark or snowshoe from the Village or mid-mountain. Pack a picnic and go in 50K's of scenic terrain. You can even see Lake Tahoe! KidzPoints: Parent's Predicament ticket for telemark skiers and lift access is $26 (share between two parents). Where to Ski: Novice skiers should try the Minglewood loop or Sawmill Flat for a longer ski. There's lots of intermediate terrain to choose from as well. Try the Tahoe loop for incredible vistas of Lake Tahoe. Pack a picnic for the Picnic loop where you can dine on picnic tables or in the warming hut. Northstar has three warming huts throughout the system and they all offer water and complimentary hot drinks. Check out the trail map for a look at the trail system. Special Programs: Lessons available for kids and adults. Package price of $36 (under 12) includes rental, trail pass and lesson. Sessions are at 10:30 and 1:00. Child Care: Minor's Camp offers child care for children two (potty trained) to six. Good Groceries: Pack a picnic and head out on the trail. Three warming huts are scattered throughout the system and offer water and complimentary hot drinks. Or try one of the many restaurants in the Village. Sleep Tight: Northstar offers some great lodging packages. 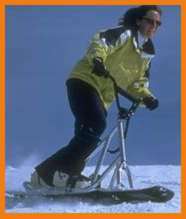 Rent: Rentals of cross country and snowshoe equipment is available. Other Fun Stuff: Try snowshoeing for a quick way to get out on the snow. Rentals for kids and adults are available from the Center and you can follow the same trail network. Or try tubing, snowscooting (pictured at left), skiing or snowboarding for thrills and chills. Location: On Hwy. 267 halfway between Truckee and Kings Beach, CA.